Portland, Oregon eatery Aviv caters to two huge food fads by creating plant-based Middle Eastern and Jewish cuisine. Tal Caspi didn’t expect to start a trend when he set up his Gonzo Falafel and Hummus food truck in Portland, Oregon, about a decade ago. He was simply craving the taste of home. After five years, Caspi left the truck and began building a mini empire of Israeli vegan enterprises. 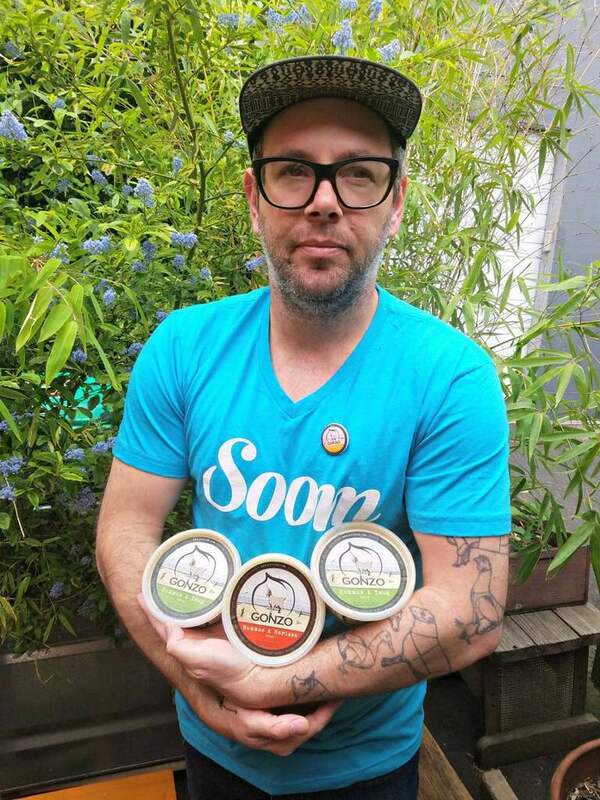 His packaged Gonzo hummus is sold in 20 Portland supermarkets. His one-year-old Aviv vegan Israeli restaurant and catering is a hit. Next he’ll open a vegan ice-cream shop offering exotic flavors like Aleppo pepper, curry and chocolate malabi (rosewater). If you want to take the pulse of culinary fads, put your finger on Portland. This uber-hip northwestern city consistently rates as one of America’s top foodie destinations. 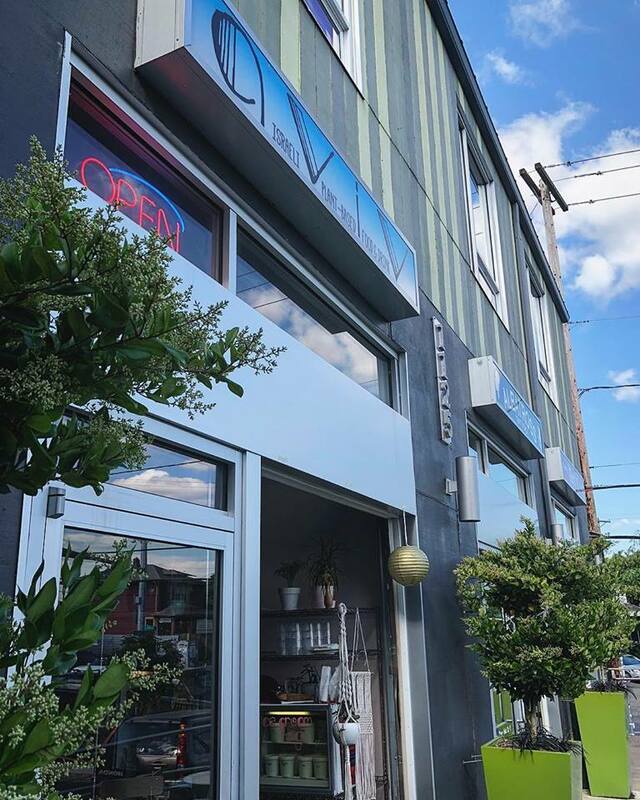 So it’s significant that Aviv is the only vegan Israeli restaurant in Portland, a city where plant-based eateries are plentiful and Israeli/Middle Eastern cuisine is well represented. Caspi says he’s brought a large helping of authenticity to the scene. Caspi introduced Portlanders to s’chug (also spelled “zhoug” or “tsug”) and other items like amba (pickled mango sauce), harissa (hot chili pepper paste) and an egg-free version of sabich, a popular Israeli street sandwich of fried eggplant, potatoes, tahini and other Mideast condiments. And they’re loving it. Shawarma, of course, is not known as a vegan dish – it’s generally shaved slices of spit-roasted lamb or turkey – but Caspi gave up animal products as part of a life overhaul in the year between closing Gonzo and opening Aviv with business partner Sanjay Chandrasekaran, owner of several Indian vegan eateries. Coincidentally, Caspi’s philosophy mirrors that of a growing number of Israelis. Israel has the largest number of vegans per capita and is a leader in the switch to plant-based restaurants. 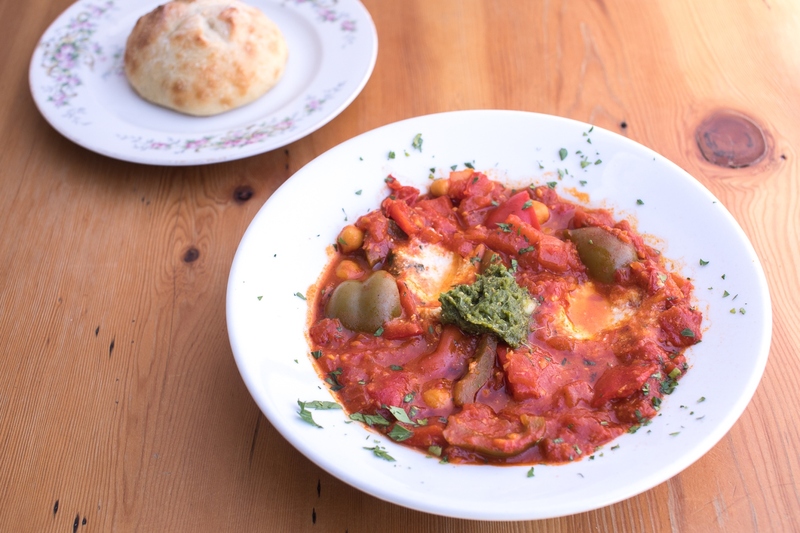 Aviv’s shakshuka – normally a poached egg dish in spicy tomato sauce – uses Japanese-style misozuke (fermented tofu) in place of eggs, along with a dash of sulphury Kala Namuk salt. Not everything on the menu is Israeli-inspired. 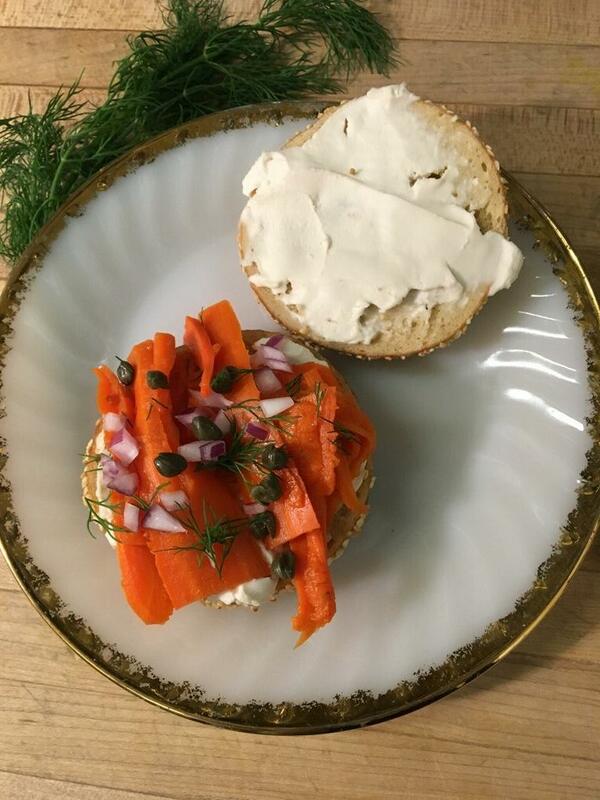 A variety of mushrooms forms the basis of dishes like “calamari” and “steak.” Salt-cured smoked carrots provide a lox-like topping for bagels. Diced tofu swims in matzo-ball soup. 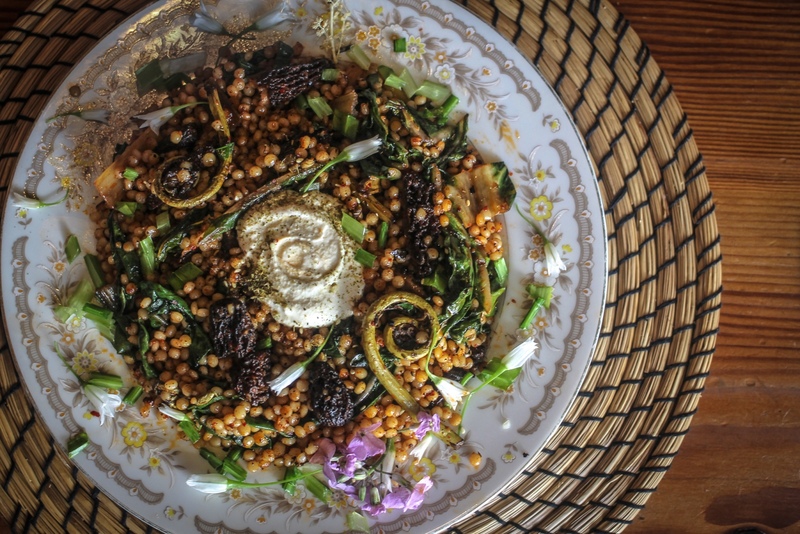 Foraged greens like morel and fiddleheads star in a dish called Enchanted Forest. Born in Ashkelon, Caspi was raised mostly in that southern Israeli coast city (where his mom and sister still live) and partly in the United States. At 18, he moved to Tel Aviv. “I enjoyed the food there and that was a huge influence on me but I did not cook. Cooking came way later,” he tells ISRAEL21c. Prior to Gonzo he worked as a line cook and manager of other food carts in town. Aviv isn’t certified kosher but Caspi points out that vegan cuisine is intrinsically kosher. The restaurant caters many bar/bat mitzvahs and Jewish weddings. Aviv has gotten a lot of press and attracts an eclectic crowd of young vegans, Indians and Jewish families including a cadre of Israelis living in the greater Portland area. “Portland is not very diverse but our clientele is,” says Caspi. Hebrew words and Israeli references pepper the menu at Aviv. For example, there’s the Neve Tzedek cocktail, a margarita-like concoction containing the African taste of tamarind and the Italian taste of Aperol. Do most diners know Neve Tzedek is an artsy historic southern Tel Aviv neighborhood? Probably not, but that doesn’t matter. For Tal Caspi out in the American Northwest, it’s a reminder of his roots.